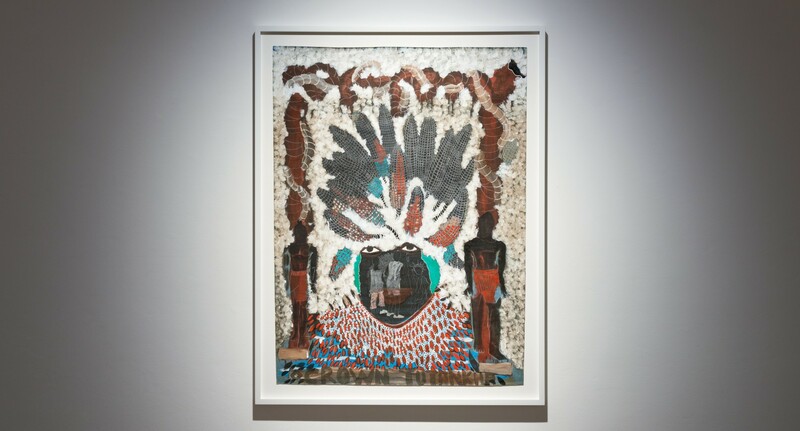 Hales Gallery is delighted to announce Supernova, an exhibition of new work by Omar Ba. 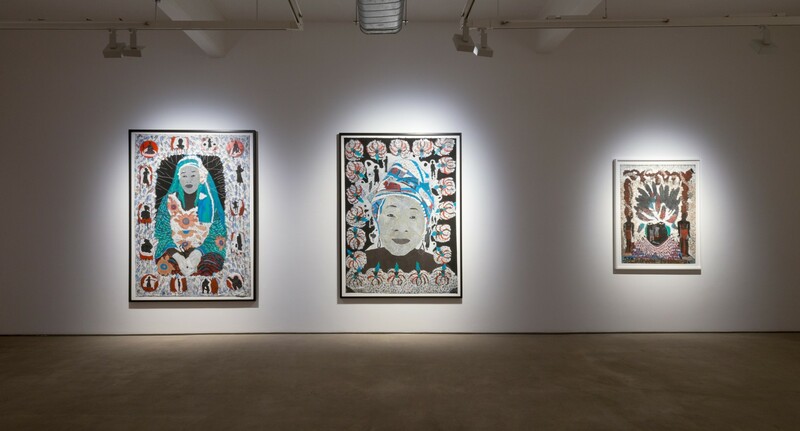 This is the gallery’s second solo exhibition with the artist. 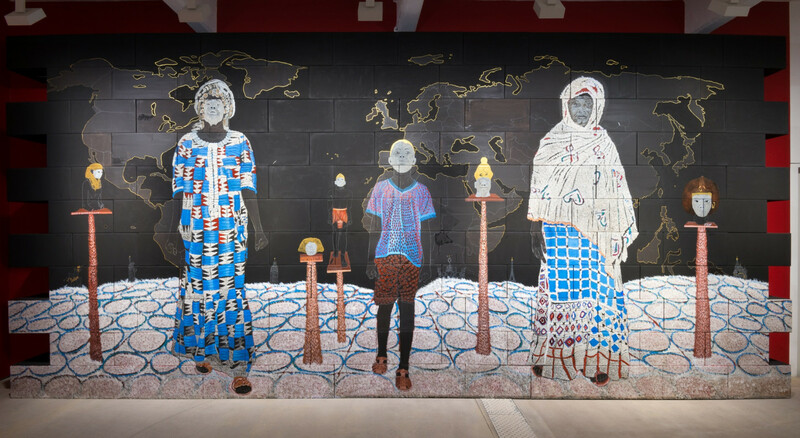 Ba was born in and grew up in Senegal, attending art school in the capital of Dakar before moving to Geneva aged 26 in 2003. It was in Switzerland around a decade ago that Ba decided to depart from abstract painting and began developing his own distinctive figurative aesthetic. 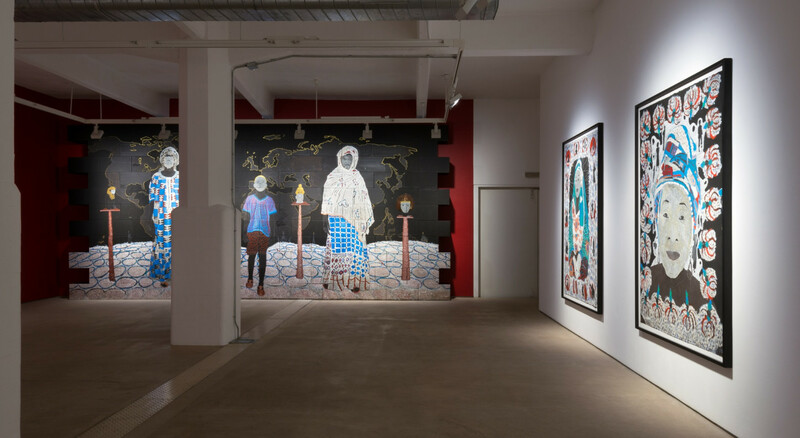 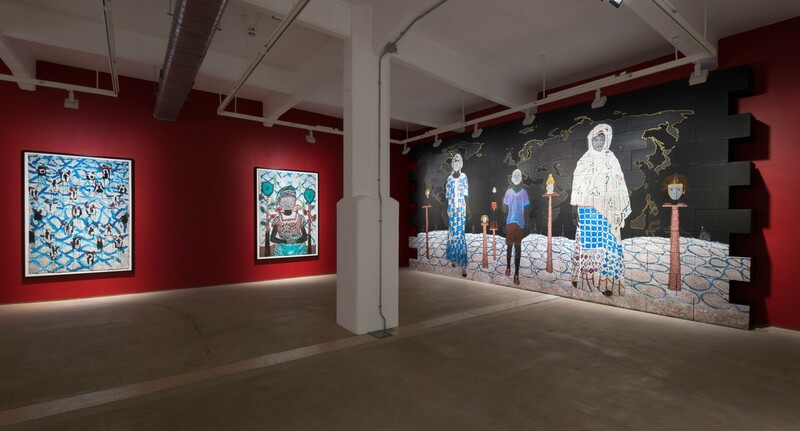 Today Ba lives and works in both Dakar and Geneva, drawing on past memories and present experiences of both cultures to create works both deeply personal and politically resonant; works that, in his words, ‘tell the stories and weave a thread between’ African and European culture. 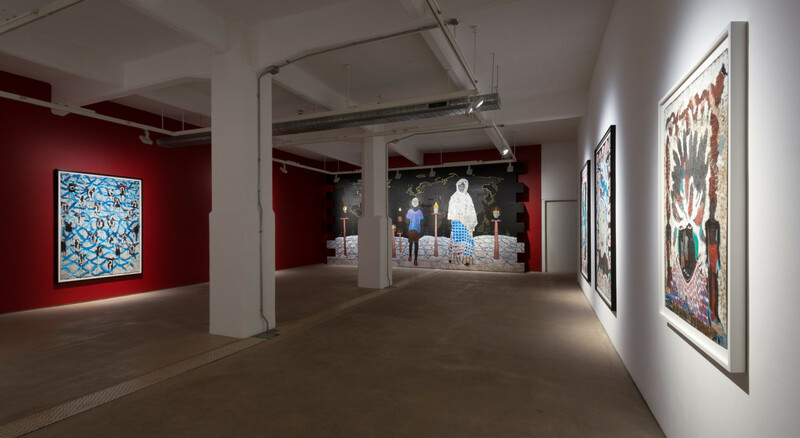 This notion of duality, whether between North and South, history and contemporaneity, the personal and the political, is central throughout Ba’s work. 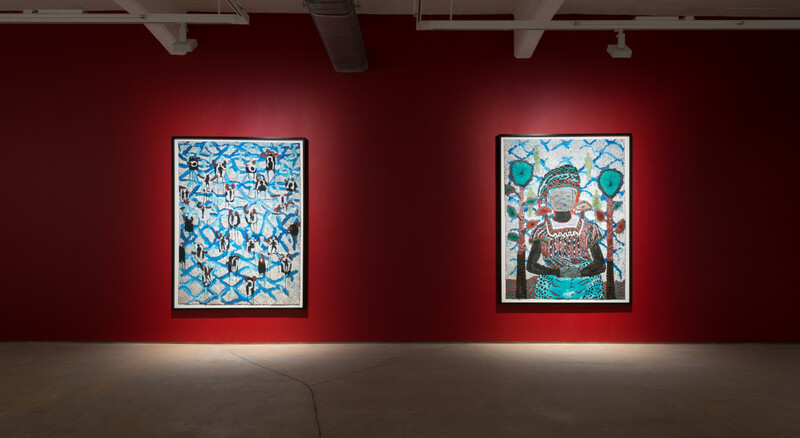 His paintings, in a fusion of figurative and decorative modes, depict part-real, part-imaginary worlds populated with human and animal beings, organic patterns, geographic and political symbols such as maps and flags – a dizzying array of earthly life. Their material composition is similarly hybrid, mixing masterful use of oil, gouache and crayon and delicately applied china ink with rough, readymade surfaces such as corrugated cardboard. 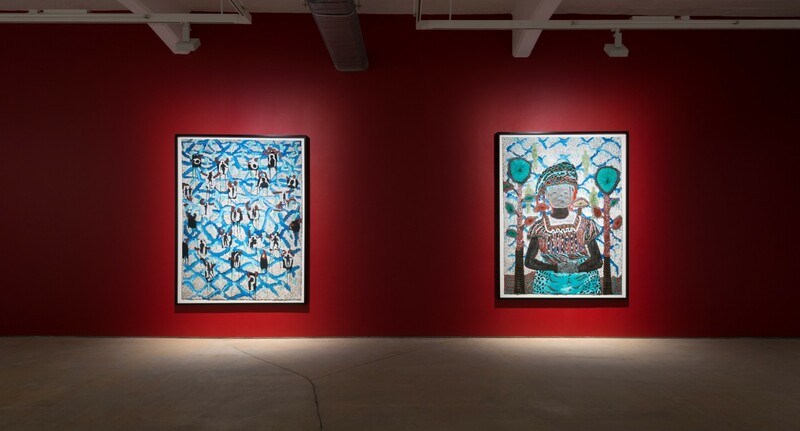 Many of Ba’s images over the past decade have depicted a world of violence and conflict, a potent exploration of the legacies of colonialism on the African continent. 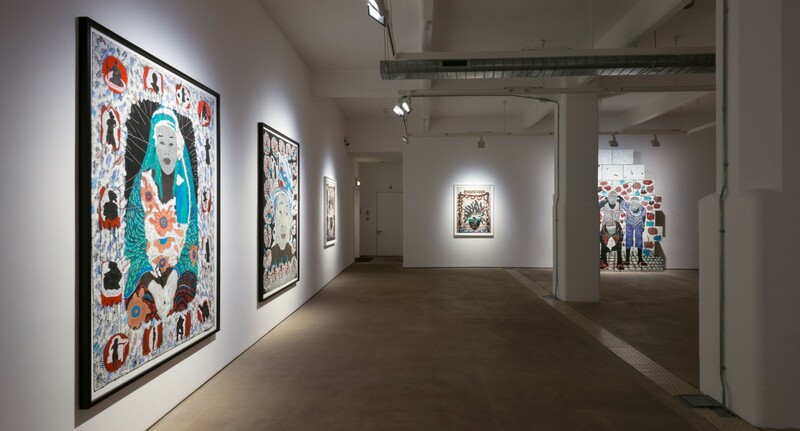 In Supernova, however, the artist’s focus has shifted. A supernova is the name given to the birth of an extremely bright, brilliant star, caused by the spectacular explosion of a massive star at the end of its life. Inspired by the supernova, its grandeur and its ancient inheritance, in this exhibition Ba proposes a celebration of the beauty and magnificence of the people of Africa, as descendants of the black Pharaohs of Egypt and Nubia – considered by many to be the cradle of civilisation. Images of mothers and children, painted against Ba’s signature densely layered and patterned backgrounds, trace what the artist has called the ‘eternal resemblance’ between the black people of today and their majestic ancestors. 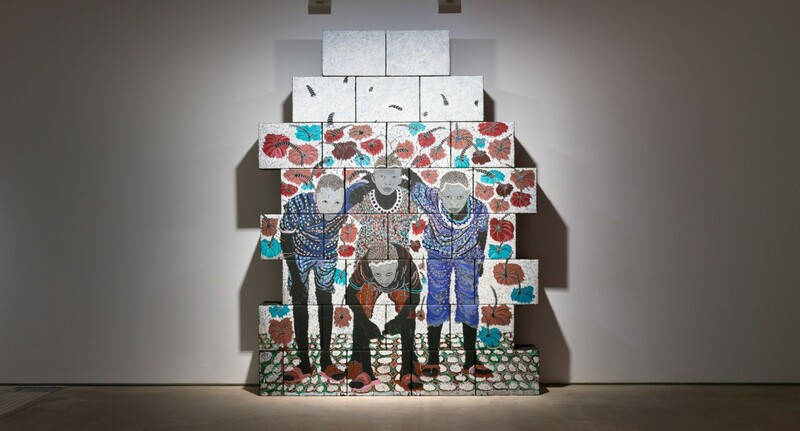 These figures are drawn from Ba’s own life – photographs of close relatives, including his mother – as well as colonial-era postcards and images of African youth that populate the media today. 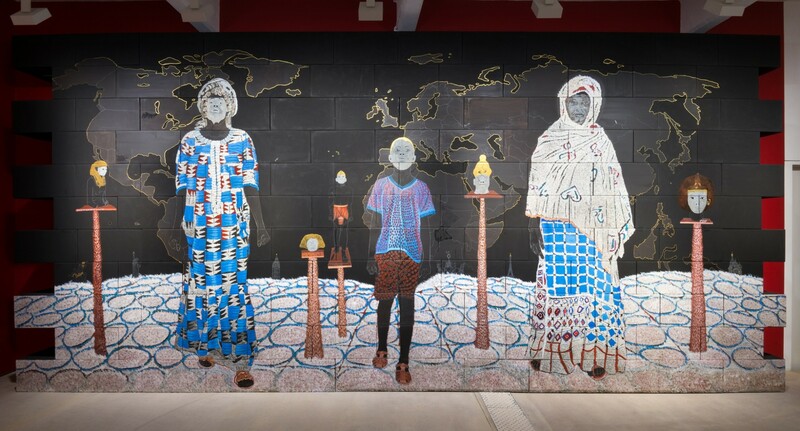 He has described these new works as an homage to women from Africa who ‘look to the future, thinking about their children’ – watching as entire generation of young adults leave the continent in search of opportunity, only too aware of the precarity of the journey to come. Deeply personal and intimate in their focus, the works in Supernova thus also convey stories with a profound social significance, conveying the value of their subjects through the beauty of their surfaces.